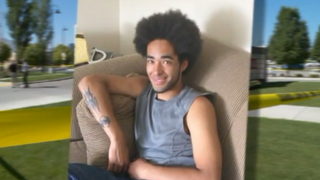 Darrien Hunt, 22, was shot and killed Sept. 10 by police in Saratoga Springs, Utah, after they responded to a call of a "suspicious" man walking around a restaurant carrying a "Samurai-type sword." Witnesses say that once police arrived, Hunt took off running. Police say Hunt lunged at them with the sword. Hunt's mother believes her son was shot to death because he was black. "No white boy with a little sword would they shoot while he's running away," Susan Hunt, Darrien Hunt's mother, told the Deseret News. It took three days for police to issue a statement about the death. According to the newspaper, police claimed in the brief statement issued Saturday that Hunt was coming toward officers when he was shot. "When the officers made contact with Mr. Hunt, he brandished the sword and lunged toward the officers with the sword, at which time Mr. Hunt was shot," Utah County Chief Deputy Attorney Tim Taylor said in a prepared statement viewed by the Deseret News. "There is currently no indication that race played any role in the confrontation between Mr. Hunt and the police officers." An attorney for Hunt's family claims that an independent autopsy shows that Hunt was "hit numerous times from behind." "This is consistent with statements made by witnesses on the scene, who report that Darrien was shot to death while running away from police," Randall Edwards, the family's attorney, said in a statement. "It would appear difficult, if not impossible, to reconcile these facts with a story that Darrien was lunging toward the officers when he was shot." According to the Deseret News, Hunt had been walking around "near Panda Express restaurant, a gas station, an auto parts store and a credit union" with the sword strapped to his back. A photo of Hunt and the police just moments before he was shot shows the young man standing between the police but doesn't show the sword. "I've been begging the police, 'Why, from the time I saw the pictures of you just standing by him with his hands to his side, does he end up seconds later with a bullet in him? And then if he's running [according to eyewitnesses], why you had to put in more bullets, and I don't even know how many.' That's what I want to know," Susan Hunt told the Deseret News. Hunt's mother told the newspaper that the sword was purchased at a gift shop and that it couldn't cut anything. She believes that Hunt might have been looking for a job, since he wore a nice shirt the last day she saw him. "I believe that maybe my son thought, 'Maybe I'll try to get a job at Panda; maybe this sword will impress them,' " she told the newspaper. "[He probably] thought he was cool with the sword. He was more of a little kid trying to be a teenager." One witness told the Deseret News that Hunt appeared "totally calm" as he walked with the sword strapped to his back. Others said that he appeared "distressed." The Utah County Officer Involved Shooting Protocol Team is leading an independent probe, and two officers involved in the incident have been placed on paid administrative leave while the shooting is investigated, the Deseret News reports. Edwards told the newspaper that the Hunt family is anxious to know the findings of the probe. "We continue to hope that a full investigation will reveal the whole truth about this tragedy," he said.